A two-time F1 World Driving Champion, Alonso has been spot-on in practice and qualifying for his first oval-track race. The 35-year-old Spaniard will start fifth in Sunday’s 33-car field after posting a four-lap/10-mile qualifying effort of 231.300 mph around the 2.5-mile Indianapolis Motor Speedway. Alonso, who is competing in a Honda-powered McLaren entry in association with Andretti Autosport, is skipping Sunday’s prestigious F1 Monaco Grand Prix to drive at IMS in “The Greatest Spectacle in Racing.” Englishman Jenson Button, the 2009 F1 World Champion, has come out of retirement to replace Alonso in Monaco and team with Stoffel Vandoorne of Belgium. 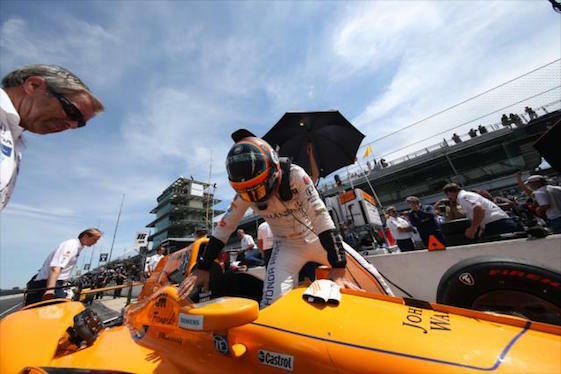 Brown has orchestrated an Alonso quest that began as borderline quixotic…but could reap worldwide acclaim and benefit for all parties involved when the checkered flag falls late Sunday afternoon. Fernando Alonso climbs into the cockpit to log practice laps at Indy. Brown said during a teleconference on Wednesday. “You say we’ve been here a month. It feels like we’ve crammed about 12 months of planning successfully into one month. Usually that’s a recipe for disaster. “The willingness, contribution, collaboration between those three entities has been outstanding, on and off the track. That’s why I think everything’s gone so well, is everyone has played their part. It might have been my wild-and-crazy idea, but it took the bravery of my bosses to say yes, it took Fernando wanting to do it. 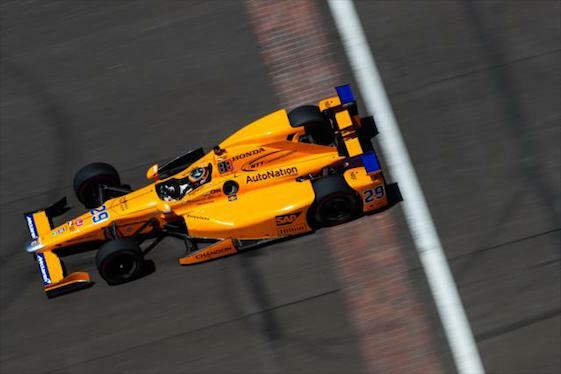 Once you got past the deal’s done, everyone at McLaren Honda, we’ve probably got 30 people that are contributing to the Indianapolis 500 project in one way, shape or form. Brown, a 45-year-old native of Los Angeles, was appointed Executive Director of McLaren Technology Group on Nov. 21, 2016, after Ron Dennis was forced out by the group’s Executive Committee. A former professional racing driver, Brown in 2009 partnered with Richard Dean to co-found United Autosports, a professional sports car racing team with an engineering base in the United Kingdom and a marketing base in the United States. THE MODERATOR: Zak, we’ve seen how Fernando has done here in Indianapolis. What have your impressions been of your experience with the Verizon IndyCar Series and Fernando’s performance to-date? ZAK BROWN: “It’s been fantastic. The team has done, both McLaren and Andretti Autosport, an outstanding job. They have had, so far, kind of a textbook Month of May. Fernando Alonso and his orange McLaren Honda have been impressively fast all month. THE MODERATOR: Your team, McLaren, has dubbed this weekend “A Race of Two Worlds.” What will Sunday be like for you? Where will you actually be watching the races? QUESTION: I’m wondering from a marketing perspective, is there any chance at all that Alonso is overshadowing other elements of the race or other participants? ZAK BROWN: “No, I don’t think so. I think clearly he’s getting the most awareness right now. But he’s getting awareness not just for himself but for Indianapolis, for INDYCAR, for Formula One. I bet there’s more people that know Scott Dixon today than before (winning) pole internationally. Obviously, Scott is a superstar, but this will have only exposed more people to him. So, I think there’s an upside for all the competitors. QUESTION: My son goes to school near the Speedway, a few blocks away. Fernando is over at his school this morning with a couple other drivers. They were playing with LEGOs, doing science projects with the kids. We can see how he’s doing on the track, but how he is reacting to the off-track demands of the Indy 500? 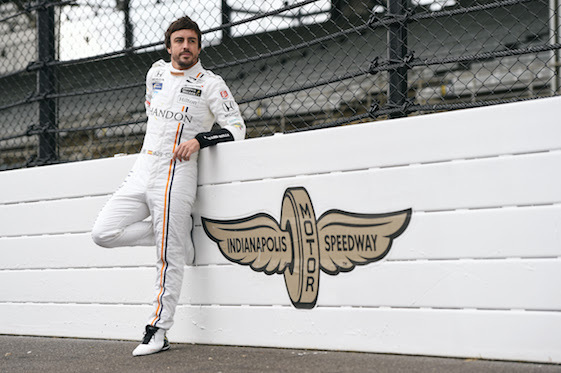 Fernando Alonso has been the big story at Indy Speedway this month. actually sent a video from someone on our media team, the video of him doing school, which I hadn’t yet seen. My comment, and Fernando’s, was, ‘Welcome to INDYCAR,’ with a big smile. QUESTION: Now that from a competitive standpoint you’ve had a few weeks to take in the whole experience, how has that changed your perspective on INDYCAR? What are the chances that we will see McLaren back on the INDYCAR grid full-time? ZAK BROWN: “Yeah, it’s been a great experience so far. Everyone at McLaren is enjoying this, has enjoyed it. The ExCom, as we call them, our Executive Committee…Sheik Mohammed and some board members, were out for qualifying. They enjoyed it. They have been around motor racing their whole life. “North America is an important, very important, market for us. We’re a racing team, but also have other businesses. Our criteria for competing outside of Formula One is that it has to be commercially viable, we have to feel we can be competitive, it fits our brand, and it doesn’t detract from our Formula One efforts, which is our primary effort. “Indy 500 and INDYCAR ticks those boxes. So, it is something we’re definitely considering. 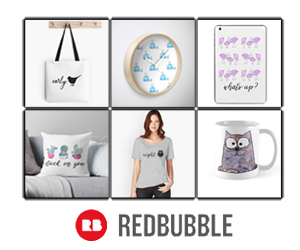 We want to get through the month. We feel good right now, but we know Indianapolis is a tough race. I hope we have the same level of enthusiasm that we do right now, which I’m sure we will regardless of outcome. It’s been a great experience. QUESTION: What is your overall take on the health of the IndyCar Series from your perspective? ZAK BROWN: “It looks really healthy to me. There’s 33 cars. I know it’s always tough to get those last few out. But they’ve got full grids and have for a long time. I think it shows how competitive INDYCAR is. Fernando has some teammates in front of him and some teammates behind him. Certainly, not a walk in the park. I think the quality of the talent, the teams and drivers, is outstanding, world-class. “They’re putting out a lot of cars. I know that their (TV) ratings now, I believe, are flat-ish for the year. I would hope and think they will be up for the 500. QUESTION: Even though you’re in F1 now, you know INDYCAR well. With so little turnover in the series, what does INDYCAR have to do to recruit new owners? Where is it going to get young drivers to eventually replace the aging veterans? 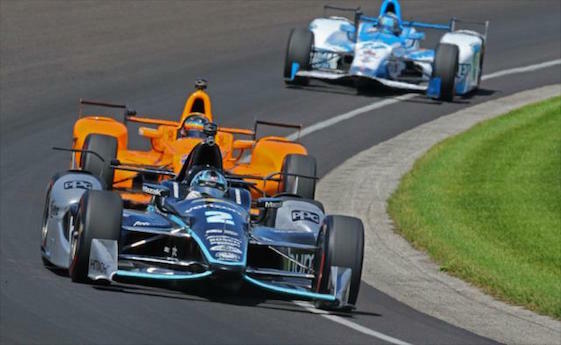 ZAK BROWN: “I think not just INDYCAR has that challenge. Formula One does. All racing. None of the grids are as healthy as you want, so you need to always be recruiting. The more economically viable motor racing is, the easier it is to find them. Not a small number are _ it’s vanity sponsorship, so your sell has to be more business opportunity than vanity. But there are some wealthy people out there that enjoy the racing, subsidize it, have very successful racing teams. “The more commercially viable, the easier. I think you have to look around at other series, as well, who might want to come Indy car racing. Unfortunately, that might be to the detriment of another series, but that’s how the world works. “Then, you know, drivers, I think that same question was probably asked 20 years ago. Unfortunately, it’s a sport that is a blend of talent and economics. We all know lots of drivers that shouldn’t have made it because they didn’t have the economics, and then we’ve seen some drivers not make it and be successful, but get into the big leagues, maybe their commercial acumen was better than their driving talent. QUESTION: I thought it was mentioned or reported that McLaren was going to bring some expertise over, some talent over, to work on the Alonso team here in Indy. Can you share with us, did that happen? Are they changing tires? Are they engineers? What kind of personnel from F1 is working on his INDYCAR effort? ZAK BROWN: “Yeah, we did bring some people over, both that have been there permanently from Day One, and then others that have gone in and out, and then some _ more than some _ lots of communication back with home base, the MTC, and not really involved in the physical elements, i.e., having anyone over the wall. QUESTION: Fernando seems to be very happy. He’s smiling a lot. His car seems to be handling really well. I saw him making passes in the short chute on Monday. He looks very confident. What’s he saying to you? Has he said, ‘Hey, I want to do this again?’ Is he just focusing on this year, not really looking at a future shot at it? ZAK BROWN: “We’ve not spoken about anything other than the race. He’s a very, very, very focused racing driver, more than I’ve seen or been around. I’ve been around a lot in various capacities. So he’s very focused. He wouldn’t want to be distracted by thinking about next year. “He loves it. It’s every bit as cool, if not probably cooler, than he thought it was going to be. It’s totally different. He very much enjoys it. He feels he’s very good around the Speedway. He’s very confident, but he’s not cocky or arrogant at all. He knows Indy can bite at any moment. So he’s very respectful. But he knows he’s got a good race car. He knows he’s fast. He has been aggressive in passing, which obviously it’s one thing to be good by yourself, good in traffic, and be able to get around traffic. His race craft in Formula One is arguably the best. “So he’s excited, because I think he has a shot. I think he has a shot, so does he, of having a great result. I think there’s 12 to 15 drivers that can win. I think there’s five or six that are the fastest. I think there are another five that are pretty darn close. With a little bit of strategy, they could win it. Then there’s probably another three or four that if it was a bit of a wild race could win it. QUESTION: For the past few years, you and your family have resided in the UK, a place near and dear to your heart, includes the headquarters for your United Autosports which will be making its Le Mans debut next month. What has it been like for you to be back? You spent the better part of 20 years living in the greater Indianapolis area. What is it like being back in your old stomping grounds? ZAK BROWN: “Starting with the last question, it feels great, and it feels different. It feels different because it’s the first time I’ve walked down Gasoline Alley and felt like I was part of the show. Obviously doing the sponsorships over the year, you’re contributing, you’re kind of part of the show, but you’re not part of the show everyone’s coming to watch. “Walking down Gasoline Alley in my McLaren-Honda-Andretti gear was special. The fans have been so gracious, hollering, and for the first time not bad hollering at me. The fans are everything from, “Welcome back’, to, “This is going to be the greatest race ever,” to, “This is what I’ve been dreaming I would see.’ Very, very welcoming. “I actually went for a two-seater ride with Mario (Andretti). That was terrifying. He’s an impressive 77-year-old. I think probably as fast as anyone. I think I’ll run him in a McLaren next year. “What it also gave me an appreciation for, because I’ve actually never been around the track, other than on a bus, which is different than Mario in the two-seater. Just in awe of Indianapolis. Very, very special moment that will probably be hard to ever replicate again how cool this is. It’s also a great blend personally of my favorite parts of motorsport, which is Formula One, World Champions, Indianapolis Motor Speedway, and INDYCAR. So to blend that all together, at least my 25 years in the business, is kind of a dream come true. QUESTION: Do you think this will spur any interest for a future return of Formula One to IMS? ZAK BROWN: “I am of the opinion that Formula One at IMS works. I think they’ve changed the configuration of the track (infield road-course) a little bit. I think it makes sense for Formula One to be at the world’s greatest racetrack. I think the city of Indianapolis is well catered to take care of Formula One, just like it did in the past, and Super Bowl. QUESTION: How do you see Alonso’s motivation at Indy? How can this be transferred to Formula One and how can this benefit your partnership this year? ZAK BROWN: “Well, I think, one, and Fernando’s commented on this, I think it’s only going to make him a better, more complete driver, which is hard to imagine because he’s about as good as you get, a 9.9 out of 10. “But I do believe, having driven myself, having some experience, driving different disciplines makes you a better overall driver. I think he will have learned some stuff here, that like we saw Jacques Villeneuve pass (Michael) Schumacher around the outside, Villeneuve kind of called his shot, I think he said that was based on his oval experience. I think he’ll take away some learning. “Obviously he has had a frustrating two years, as we all have, with our lack of competitiveness. That can get you down after a while. I think he is enjoying this so much that I think it’s going to keep a smile on his face for a while. We’re working hard on giving him a better race car in Formula One. I hope this was a good experience for him that puts him in a very happy mood. “He really likes how McLaren goes racing. This wasn’t just a brave decision by Fernando to do the 500, this was a brave decision by the owners of McLaren to get behind this project. So I think he likes that environment. I know he likes that environment. QUESTION: Please tell me that McLaren is considering getting into the mix of chassis manufacturers for INDYCAR. ZAK BROWN: “Yeah, so personally, and I think it would be good for the sport, also with my viewer’s hat on, I think a couple different chassis manufacturers, as long as you can economically make it work, that’s usually why going to a single ends up happening. But if you look back at the kind of late ’80s, early ’90s when Indy car was nipping at the heels of Formula One as far as popularity, it had a mix of a few chassis, had a mix of a few engines. I’d love to see that happen again. QUESTION: (Alexander) Rossi is showing outright speed this year, which surprises me. Has that come from hanging out with Fernando or from the insight McLaren has been able to give to the Andretti team? Has he better taken advantage of it than some of the other drivers in the team? ZAK BROWN: “Well, I don’t know why specifically Rossi. What I can tell you is, without getting into too much detail, some stuff that Fernando has learned about the car has been transferred to the other cars. Of course, vice versa. Fernando and McLaren, we’ve learned more from Andretti and the drivers than they’ve learned from us. But there has been areas. We’ve operated as one team. So happy to share information because it goes both ways. QUESTION: You’re coming over for the race. Are there any other McLaren brass coming over, management, with you on that flight? ZAK BROWN: “On this particular flight, no. We will have lots of people there. It was very important. They flew out last weekend and spent two days. We had dinner at Mark’s house with Michael and Fernando. They took in the whole weekend. They thought about it. They wanted to be here. QUESTION: Back to the question that was asked earlier about F1 coming back to Indianapolis Speedway. There’s no secret that the INDYCAR Grand Prix has somewhat struggled with crowd count on a Saturday event. F1 started to struggle there for a while, and that’s why they’re gone now. What do you think about the idea of having a doubleheader weekend, a Saturday and Sunday race, INDYCAR on Saturday, F1 on Sunday, back at the Speedway, to generate interest from both camps? You may even have some crossover, some drivers doing both races. What do you think about that idea? QUESTION: Have you changed your approach towards the race in terms of your expectations following Fernando’s fantastic performance in qualifying? Is there anything you have learned from your experience in INDYCAR that you can bring back to Formula One, kind of tell those guys, Maybe we could do this, in terms of fan engagement? Do you think there’s anything F1 can learn from INDYCAR? ZAK BROWN: “Our approach, and Fernando’s approach, is to just keep doing what he’s doing, which is head down, very focused, one day at a time. You set out goals for that day. So far we’ve hit those individual kind of daily goals. “Now he’s got to get through the race. He was a little disappointed in qualifying, which is good. It shows how much he wants to be at the front. I think he believes he could have been the front row. We had done an engine change in the morning, and there’s some tuning that needed to be done during qualifying. He’s going out there trying to win the race. “I think you can only set your expectations after you’ve seen how the first week has gone. Because it’s gone as well as it has, and he’s clearly very fast, has a great car, we’re going in trying to get a great result. We’re going for the win, just like 32 other drivers are. “I think, because things have gone well, we’ve got a good chance. But, as we discussed earlier, so do a dozen other drivers. So we’re going to go in. He’s going to race hard. He’s going to go for it. I think at Indianapolis anything can happen. “Then as far as your second question, learning from Formula One. I think Sean Bratches, Ross Brawn and Chase Carey, the leadership of Formula One, are all over identifying and bringing more fan engagement to Formula One. So I think, of course, there’s stuff they can learn from all sports. The good news is they want to see it. “I share information with them. They are thirsty for information and ideas. I think the way the test was covered was outstanding. INDYCAR did an excellent job there. That shows how engaged our great fan base is, that if we can communicate with them through things like social media, you can feel a real interaction with the fans, because they tell you real-time via Twitter, Facebook, websites, how you’re doing, what they think. The more you can have a two-way conversation, the better.